SINGAPORE (Feb 19): Singapore Finance Minister Heng Swee Keat boosted health-care and military spending, gave tax rebates to citizens and tightened rules on foreign workers ahead of an election that could come as early as this year. Heng announced a new $8 billion support package for seniors in his budget speech on Monday, as well as measures to help local businesses adopt new technologies. 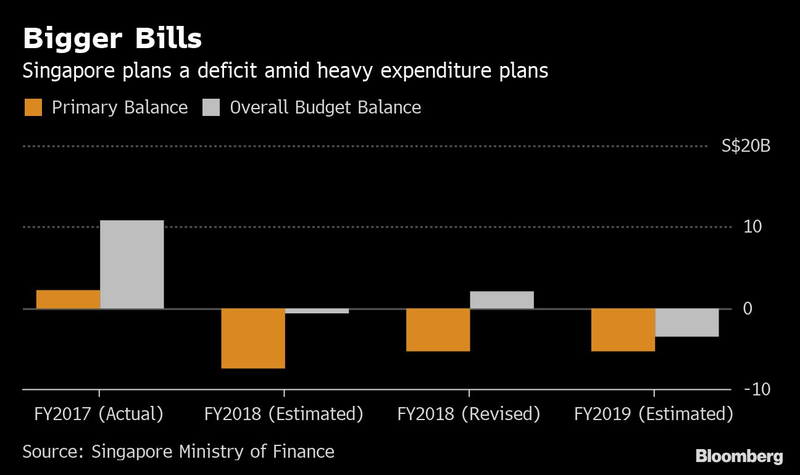 The expansionary fiscal plan will push the overall budget deficit to 0.7% of gross domestic product in the year ending March 2020, from a revised surplus of 0.4% this year. The finance minister opened his speech by talking about the changing global and domestic landscape and the importance of planning for the long term, while being open to diversity. Weaker demand and U.S.-China trade tensions saw Singapore’s export-reliant economy grow at a slower pace than expected in the fourth quarter. There were a slew of support measures for Singaporeans as they age, including a plan to make it more affordable for citizens to visit clinics in their neighborhood. The government expects to pay out more than $200 million a year in Community Health Assist Scheme subsidies and will increase health-care spending by more than 10%, compared with revised estimates for 2018. Companies that could benefit from the positive sentiment in the sector include listed providers Raffles Medical Group Ltd., Thomson Medical Group Ltd. and OUE Lippo Healthcare Ltd. The government is giving support to a large cohort of the population that came of age during Singapore’s independence era in the 1960s. The package primarily includes health-care support, but also top-ups for spending on community activities and public transport. The government will set aside $6.1 billion for a new Merdeka Generation Fund that will benefit about 500,000 citizens. 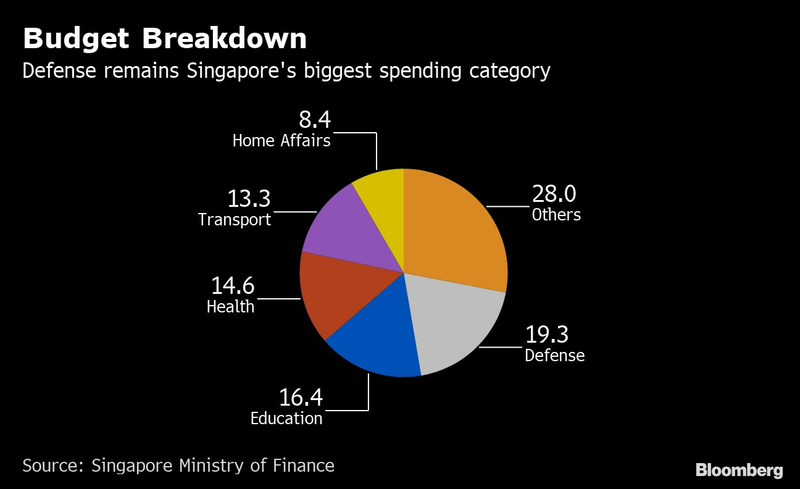 Citing an increasingly uncertain geopolitical environment, Heng allocated more spending on defense, security and diplomacy, which makes up about 30% of government expenditure. Beyond the threat of physical attacks, the government is focusing on cyber security, and will set up an agency to beef up its capabilities. While Singapore is one of the safest cities in the world, “we must not be complacent,” Heng said. Creative Technology Ltd., which was cited in Heng’s speech as an example of a local company “at the cusp of a major breakthrough,” pared losses to 3% from 6.3% on Monday. Heng spoke at length about the importance of planning for climate change, saying the government is studying its implications “carefully” and will have to “invest more.” It expects to increase spending on the environment and water resources by almost 29%. Singapore will apply a carbon tax on this year’s emissions and double its excise duty for diesel taxes to 20 Singapore cents per liter with immediate effect. While the government will provide support to help businesses adjust, this could hit companies including Singapore’s largest taxi operator, ComfortDelGro Corp.
Singapore will provide a $1.1 billion “bicentennial bonus” to commemorate the 200th anniversary of Sir Stamford Raffles’ arrival on the island. 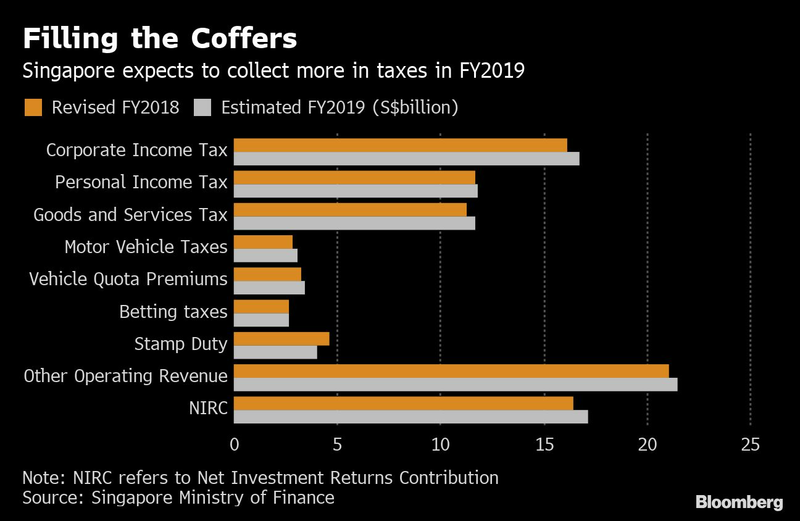 This will include as much as $300 in payouts for lower income Singaporeans and a personal-income tax rebate of up to $200 for all individuals. Heng said Singapore’s reliance on foreign workers is not a long-term solution, and that the country has to calibrate policies to raise productivity. While keeping the foreign-worker quotas for manufacturing and shipping intact, companies in the services sector -- such as food and retail businesses -- have to reduce the number of foreigners they hire. This could impact restaurants such as Koufu Group Ltd., Jumbo Group Ltd., Kimly Ltd. and BreadTalk Group Ltd. Starting Tuesday, travelers going overseas will receive less tax relief for their spending due to “rising international travel,” Heng said. He also announced a cut to the alcohol duty-free allowances to two liters from three liters. These could affect Duty Free International Ltd., which operates a chain of duty-free retail shops.